Magnificent to look at and even more divine to take in. She is an ancient spice fit for kings and queens. The inner bark from the cinnamon tree was used in ancient Egypt not only as a beverage flavoring and medicine, but also as an embalming agent. Mentioned in the Hebrew Bible in the book of Proverbs, the lover's bed was perfumed with myrrh, aloes and cinnamon. Heavenly. For my chai, I crush the sticks into small chips with a mortar and pestle. 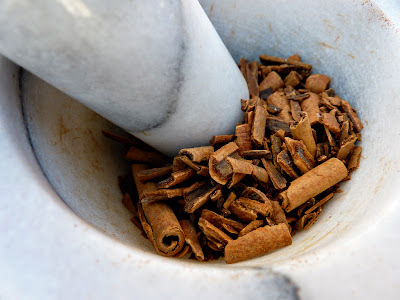 Crushing the cinnamon bark (and all other spices for that matter) releases their essential oils making them more flavorful. Not only do the cinnamon chips infuse all of this goodness and flavor into my chai concentrate, but the mortar and pestle experience helps me work out some of my pent up angst. Which can be quite satisfying after a long hard day on the range. All angst aside, the cinnamon chips are an elemental component of my chai spice mix. And this music here, it's such a sweet accompaniment to my sweet cinnamon experience. Valero M, Salmeron MC. Antibacterial activity of 11 essential oils against Bacillus cereus in tyndallized carrot broth. International Journal of Food Microbiology. 2003 Aug 15;85(1-2):73-81. Hlebowicz J, Darwiche G, Bjorgell O, Almer LO. Effect of cinnamon on postprandial blood glucose, gastric emptying, and satiety in healthy subjects. American Journal of Clinical Nutrition. 2007 Jun;85(6):1552-6. Khan A, Safdar M, Ali Khan MM, Kjattak KN, Anderson RA. 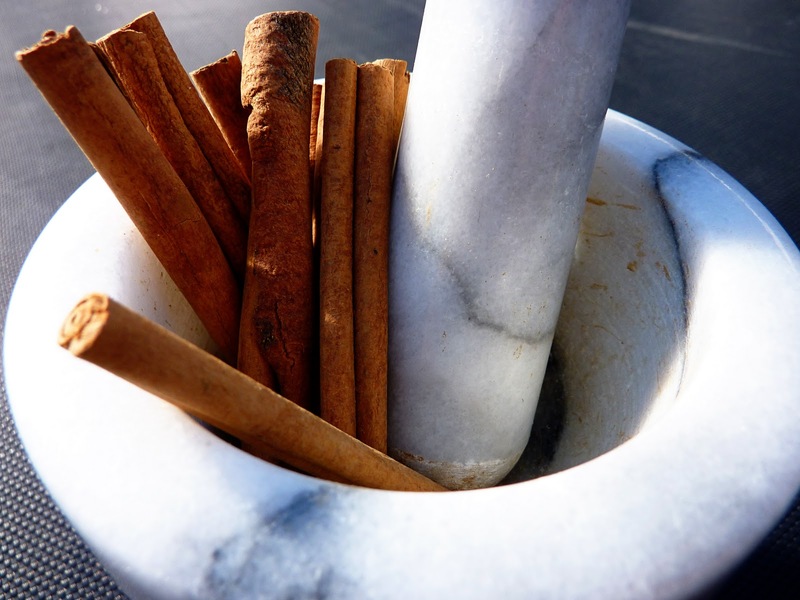 Cinnamon improves glucose and lipids of people with type 2 diabetes. Diabetes Care. 2003 Dec;26(12):3215-8. Zoladz P. Raudenbush B, Lilley S. Cinnamon perks performance. Paper presented at the annual meeting of the Association for Chemoreception Sciences, held in Sarasota, FL, April 21-25, 2004. Yes I can vouch that cinnamon gets a man in the mood:). Good to know, ladies. I'll be sprinkling my bed with myrrh, aloes and cinnamon tonight! Or is it better to apply it as a perfume?